Liberty Intl. - San Diego Intl. Parking is an extra $35 a night and there is a mandatory $25 destination fee. I don’t understand if it is a mandatory fee, why isn’t it included in the room price. We didn’t use any resort facility, yet we had to pay for it which was unfair. We enjoyed the location and the staff...amazing! The mattress was not as comfortable as some and the pillows could be newer...over all the stay was EXCELLENT. 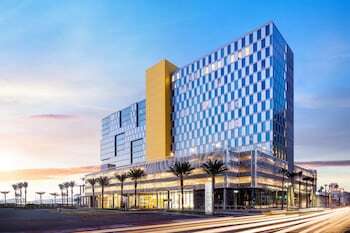 The security this hotel has were elevator wont let u access the rooms without your room key rooms really clean very good amenities but little to pricey but overall great experience would definitely stay at hard rock hotel in the future. Inexpensive but well run... friendly staff in good location. One of the main draws of a San Diego vacation is that the weather is pleasant year-round -- temperatures range from 60 to 80 degrees. That said, there can be some distinct differences in the travel seasons. For example, the boardwalk from Belmont Park to Pacific Beach is a bustling family hotspot in summer and a quiet jogging path come fall. Grey skies in May and June are common, so August and September are better bets for sunshine and ocean temps that don’t require a wetsuit. October, February and March are in-between months when travel rates are lowest. See a Padres game at the modern Petco Park without the hassle of parking downtown. Park at Qualcomm Stadium for free and ride the Trolley straight to the stadium. Hunt for antiques in the funky Ocean Beach neighborhood, followed by an evening stroll along nearby Sunset Cliffs. Let 24-hour coffee shop Lestat’s be your window into the hip North Park/Normal Heights neighborhood. Lattes are strong and tongue-in-cheek gargoyle décor is a break from San Diego’s otherwise sunny personality. Explore the (free) gardens at the Encinitas Self-Realization Fellowship Hermitage and Meditation Gardens. You’ll be asked to keep voices down and cell phones off while strolling among koi ponds and peering over surfers from a pelican point-of-view. Finding a place to start amid the country's best craft beer scene might be intimidating. Neighborhood Ale House (downtown San Diego) offers samples and an innovative California burger menu. Or make a day of it: Several brewery tour operators will pick you up from your hotel. Take it easy by letting the clever crew at Orbitz bundle up your hotels and flights. 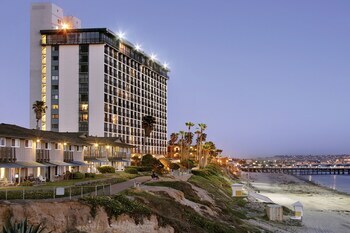 An unforgettable San Diego trip is waiting! Think of all the cash you'll save by bundling your bookings. Choose your preferred hotels, airfares, rental cars and experiences and you could save up to $857*! As well as that, you'll be excited to know that you can customize your getaway by picking from 500 airlines and no less than 500,000 accommodations across the world. Our packages will help you put together the adventure you've been dreaming about. With unlimited options to bundle your flights, hotels and more, the only thing you've got left to do is pack your bags. Pesky forms, cards and paperwork — forget that! We've devised a straightforward system. Just carry on booking with us and you'll earn instant Orbucks! For special perks and added extras at Orbitz Rewards VIP Hotels, just earn gold or platinum membership. How do you do that? Stay four nights for gold status and 12 nights for platinum status. And don't forget — you can use your Orbitz Rewards points on your very next booking. You don't need to wait until you're buckled in your seat looking at the flight path to find out where San Diego is — allow us to point you in the right direction. It's a neighborhood of San Diego County. You'll find it 0.1 miles south of the downtown area. Last time they counted, the population of San Diego County was 1,300,000. Get your escape off to a spectacular start by stopping at the San Diego Convention Center. This leading sight is within strolling distance. The USS Midway Museum and the Maritime Museum of San Diego are a few significant sights that are within easy reach. March on over to Navy Pier, explore the site and try to understand what being a part of the military is like. Want more nearby options? Centennial Park is appreciated by many tourists and locals. Pack a picnic lunch and unwind in the green surroundings. But wait, there's even more. Do you need some time out from sightseeing? Rest for a moment as you step behind the gates of Japanese Friendship Garden, a spectacular private garden. How about exploring the region on your own terms? Be the creator of your own epic adventure by checking out car rentals in San Diego with the help of Orbitz. If you're arriving by air, it's easy to pick up your car from San Diego International Airport. Economy Rent a car is a reliable outlet. You might like to rent a ride from Avis at 640 Broadway. They are conveniently located right in the city center. Why don't you also check out Enterprise? They can be found nearby at 900 F St Ste 167. 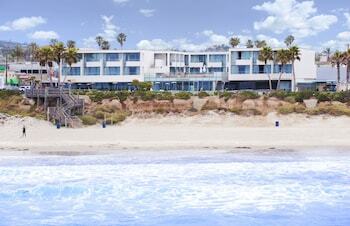 Secure your hotel in San Diego via Orbitz right now! There are no less than 215 choices in this awesome destination, so locking in a nice room will be a breeze. There's nothing better than a little bit of luxury. 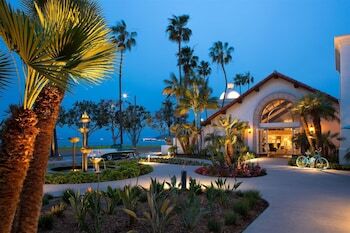 The Hotel del Coronado, Curio Collection by Hilton (1500 Orange Ave) and the Paradise Point Resort & Spa (1404 Vacation Rd) are fantastic upmarket hotel options! The San Diego Metro KOA and the La Avenida Inn are some budget options. Consider booking one if you'd prefer to save money for action-packed activities. 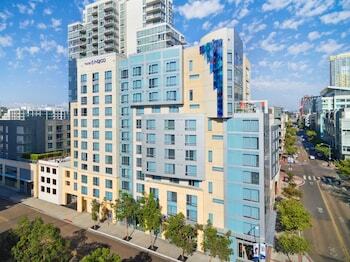 Take your pick of accommodation options practically on the doorstep of the San Diego Convention Center if you're in the mood for staying nearby. The Hard Rock Hotel San Diego is just 0.10 miles away. 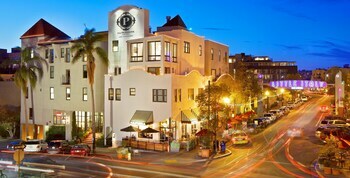 If that's not to your liking, try out the San Diego Marriott Gaslamp Quarter, which is 0.2 miles away. If you're setting out for San Diego, chances are your trip will begin at San Diego International Airport (SAN), which is 2 miles to the northwest. Once your plane has hit the tarmac, pick up your bags and get going on your next incredible adventure! Take the opportunity to explore some nearby destinations such as Gaslamp Quarter or Civic Core. Gaslamp Quarter is approximately 0.1 miles from San Diego, while Civic Core is 0.2 miles away. You can relax knowing that whatever the motivation behind canceling or amending your booking, we won't slap on a fee.^ Why not contact your chosen airline and hotel and ask if they have similar policies?